This production opened on November 11, 2005 and closed on November 20, 2005. Written by J.M. Barrie and adapted by John Caird and Trevor Nunn. All performances were be held at Capt. Isaac Paine School in Foster, RI. WHO DO YOU KNOW IN THE NEVER LAND? 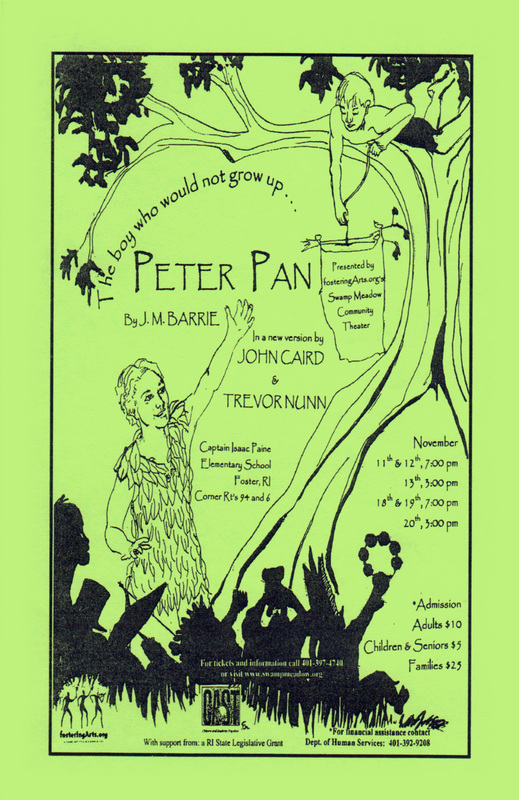 fosterinArts.org’s Swamp Meadow Community Theatre (SMCT) wishes to express our gratitude to all those involved in the very successful auditions for Peter Pan The Boy Who Would Not Grow Up, A Fantasy in Five Acts by J.M. Barrie. This new version from Dramatists Play Service Inc. is written by John Caird & Trevor Nunn. Over 100 people from our community and beyond participated in the audition process. As our rehearsals begin, our director, Sandy Arnold and assistant director, Bob Hollis are proud to announce to you the members of the cast who will draw you into the adventurous home of Peter Pan, the Never Land. The Storytellers, George Christie & Lona Robillard wll be your guides into this fanciful play. The ever youthful and endearing Peter will be played by Casey Jo Salzillo. Capturing your hearts as Wendy is Julie Cox. The delightful Darling family will be: Jake Wolf-Jensen as John, Emily Colasante as Michael, Gary Pickard as Mr. Darling, MaryJo Chretian as Mrs. Darling, Alexandria Albanese as Liza and Amanda Pease will bring Nana to life. Commanding the dangerous and dastardly pirates is Burr Harrison playing the dapper Hook. Marissa Albanese will be Hook’s right hand man, Smee. Rounding out this derelict band is Phil Colasante as Cecco, John Barnes as Jukes, Kayla Gagnon as Starkey, Nick Corey as Skylights, Ed Morgan as Noodler, and Artie Robillard as Robert Mullins. Delighting you will be the loveable and lively Lost Boys. Dan Holmes will be playing Slightly, Olivia Harrison will be Tottles, Michelle Chretian is playing Nibs, Curly is being played by Julia Arnold, bringing the first twin to life will be Liam Daily and playing the second twin will be Sarah Wilson. Other enchanting inhabitants of the Never Land include: Meaghan Sprague as Tiger Lily, Tanner Morrisey as Great Big Little Panther, Katherine King as the Ostrich, Brooke Solteys as the Never bird, and Francis Donnely as Hook’s nemesis, the Crocodile. Several groups complete the population of Peter Pan’s world. Portraying the mesmerizing Mermaids are: Jane Barnes, Leslie Barnes, Marah Bessette Branch, Lauren Hallberg, Olivia Macaruso, Miranda Raynor, Kayli Robinson and Emma Wolfgang-Smith. The members of the proud Piccaninny Tribe are being played by: Samantha Albaneese, Annie Driscoll, Amanda Gagnon, Isabella Georgianni, Michaela Green, Justin Martin, Ezra Sheridan and Amanda Wilson. The wonderfully wild Wolves gracing our stage will be: Emily Chretian, Luke Green, Heron Kennedy, Sierra Kennedy, Krystal LaValley and Morgan Raynor. Rounding out our cast will be Anna Barnes, Tess Coutu, Katherine Kent, Aidan Lurgio, Chase Lurgio, Sarah MacDonald, AnaCapri Mauro, Meghan Morrissey, and Madison Seltys. Ending our play introduces us to an adult Wendy played by Stacey Barton and her daughter Jane, Mariah Harrington who gives us a glimpse of the never ending quality of the Never Land. Six performances for Peter Pan the Boy Who Would Not Grow Up were held at Capt. Isaac Paine School.